Disclaimer: The books listed on this page are meant as helpful suggestions. Applicative is not affiliated with the publishers or authors and does not profit from the sale of these books. 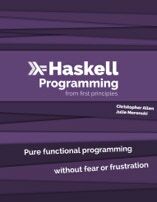 This very thorough book introduces Haskell from the ground up all the way to advanced concepts. It has been highly recommended as a companion to Haskell for Mac by several Haskell for Mac users and has received very favourable reviews. It is currently available through an early access program. This tutorial is very approachable with fun illustrations. It's designed for the complete beginner. Focussing on reading through a series of real programs first, it slowly introduces you to writing your own as well. 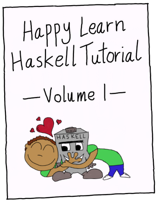 Volume 1 covers only the most basic Haskell needed to write tiny programs. A funky text for a funky language. This book explains functional programming from the ground up, even getting to advanced concepts, such as monads, applicative functors, and zippers. It assumes a previous knowledge of general programming concepts. This is the portal to a wide range of resources related to the Haskell programming language, including the offcial language standard, open source library repositories, tools, mailing lists, and so forth. FP Complete’s School of Haskell provides a comprehensive set of interactive online tutorials. They range from Haskell basics up to the use of advanced language extensions.